Session one was a presentation from our CEO and co-founder Andy Cockburn. He made a strong case for the referral channel in a marketing landscape where trust in brands (and advertising media) is on the decline. 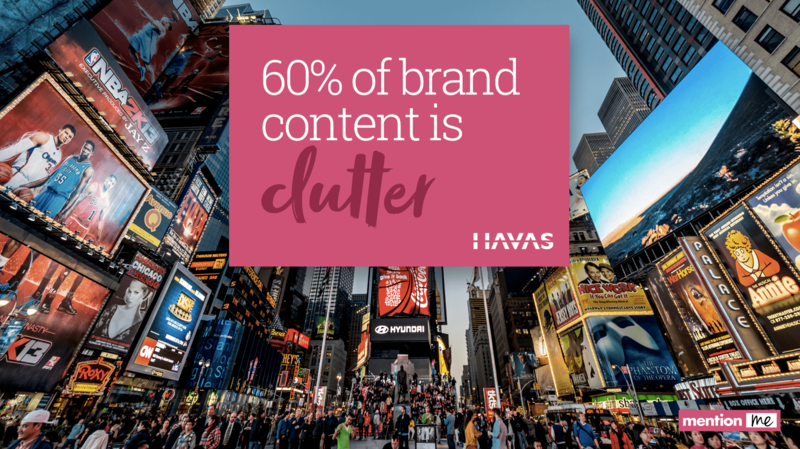 He also discussed the compounding problem of content clutter and ad blindness a result of bombardment with advertising. 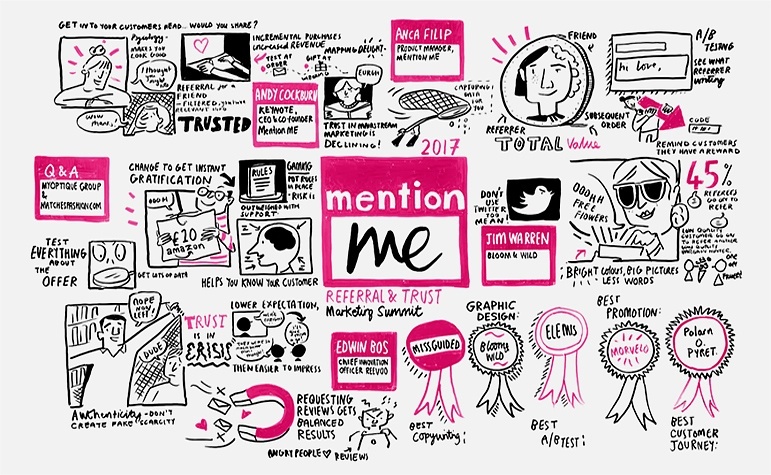 Session two came from a panel of Mention Me’s clients discussing the inner workings of their referral programmes. The clients were very candid, covering subjects like the impact of referral on their business, how they push volumes of customers through the referral funnel with promotions, their approach to A/B testing and gaming controls and their reflections on different referral behaviours they’ve seen in international markets. The audience really appreciated the real-life advice and insight in this session and gave the panelists a warm round of applause. Then just before the break we heard from Edwin Bos, Chief Innovation Officer at Reevoo who gave a visionary talk about the importance of trust and authenticity in marketing. 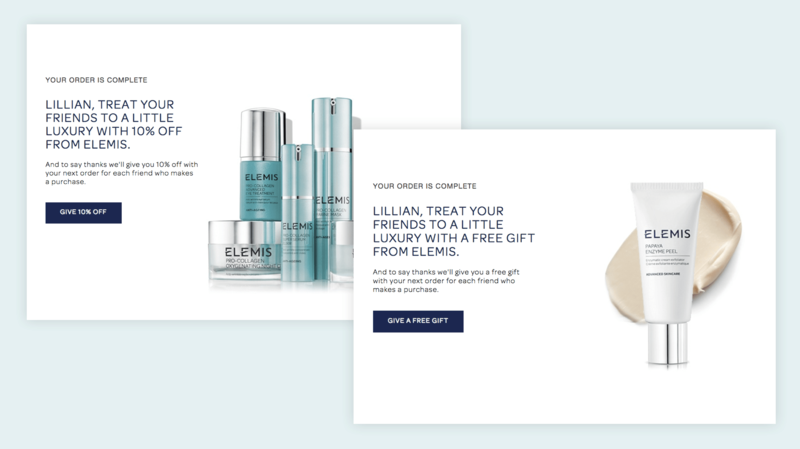 Best A/B Test was awarded to ELEMIS for a test which compared the performance of a free gift with a discount and looked at the ability of each reward to drive both sharing AND purchase. The test was particularly interesting for many beauty brands: the free gift encouraged more sharing but when it comes to measuring the full effectiveness of the incentive throughout the entire funnel the 10% discount was the best option. 10% off was 3x more likely to drive new purchases. 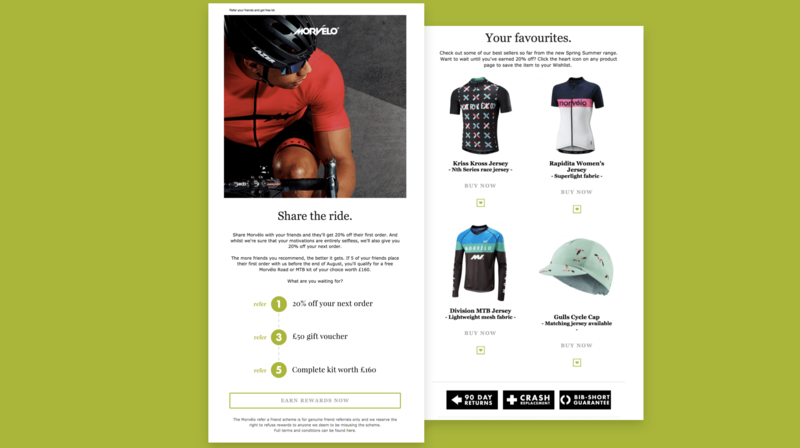 Best Promotion was awarded to the cycle brand Morvèlo who featured our tiered reward system in a well designed email promotion to encourage sharing. 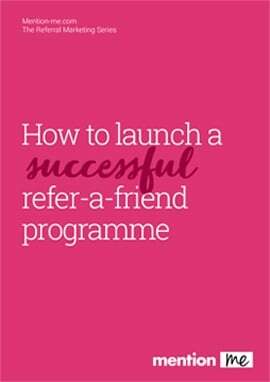 They used a system with three levels of incentive for 1, 3, and 5 friends introduced. 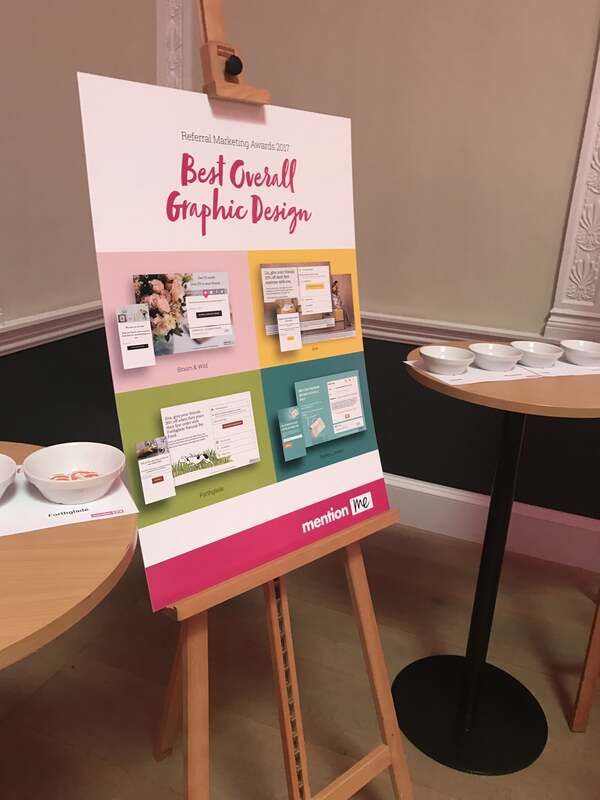 Best Graphic Design was voted on by our guests on the night and they selected the designs from Bloom & Wild. As we heard later in the evening, no element of the Bloom & Wild designs has been left untested. We love working with the team at Bloom & Wild because they are always keen to AB test everything from the copy to the incentives to the size of the flowers in their photography! Best Copywriting voted on by the event guests and awarded to Missguided for their cheeky, casual tone of voice, which really captures the brand’s essence. Finally we awarded our top prize; recognizing a brand who had created the best possible customer journey across all their referral touchpoints. The audience voted based on desktop and mobile customer journey and also considering the elements which are included in the email channel. Our deserving winner was the team at Polarn O. Pyret – they have taken such care over all the details of their design and it pays off with excellent performance of the scheme too! Congratulations to all the award winners – we had a great time during that part of the afternoon and we are looking forward to making it an even bigger part of the event going forward! We rounded out the afternoon with two further presentations. 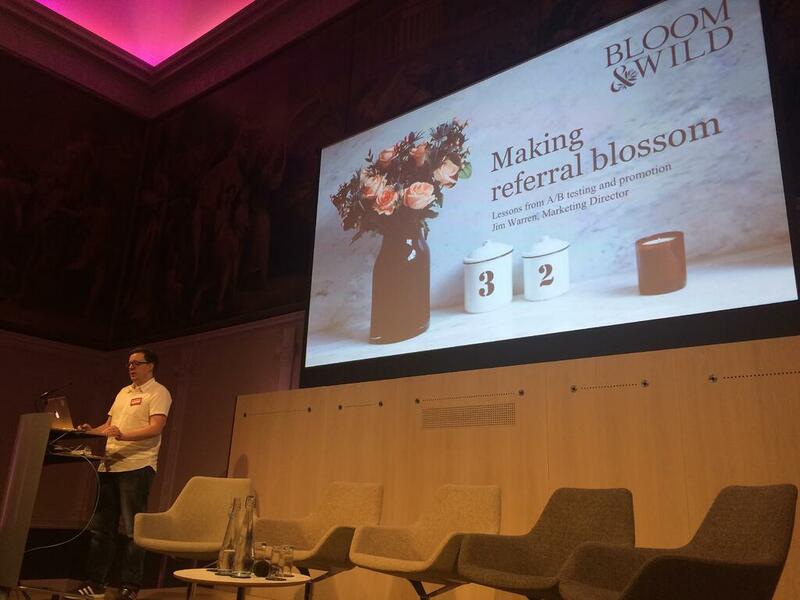 The first, from Jim Warren, Marketing Director at Bloom & Wild who shared the experiments and promotions which have made the biggest difference in optimising their refer-a-friend programme over the past 3 years. The second was a round-up of the latest developments here at Mention Me. Presented by our very own Product Manager Anca Filip; this session covered some of our latest features: our tiered rewards system which allows you to offer cumulative rewards for multiple referrals (e.g. £10 off for a single referral followed by £20 for two referrals, etc) and our new client reporting suite both got a warm reception from the audience. And there you go… the dust has settled on our client event for another year, the feedback surveys are compiled, the presentations emailed, and the round-up blog has been written ;-). 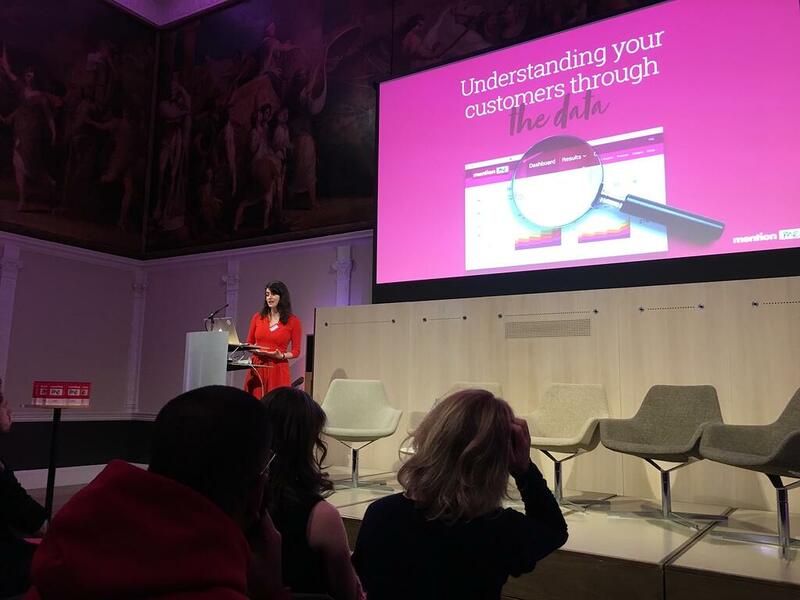 The Trust and Referral Marketing Summit: we love curating the content, we love hosting it on the day, and we love getting friendly with our clients! Bring on 2018!